Down economy and Huntsman may impact his campaign donations. 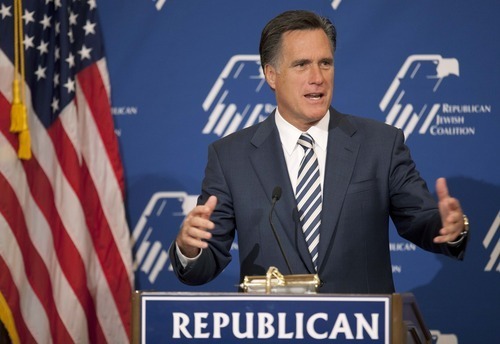 Mitt Romney speaks at the Republican Jewish Coalition annual leadership meeting, Saturday, April 2, 2011, in Las Vegas. 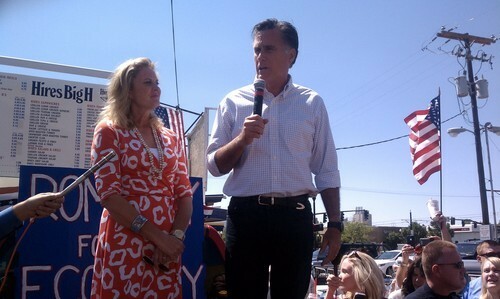 (Julie Jacobson/The Associated Press) Leah Hogsten | The Salt Lake Tribune Republican presidential hopeful Mitt Romney, appearing with wife Ann at Hires Big H Drive-in in Salt Lake City recently, raised $1.3 million in campaign donations in Utah from April to June. Washington • Mitt Romney can still count on Utahns to fuel his run for president, but the $1.3 million in campaign donations he gathered in the past three months is less than half of what he received from the state at this stage during his previous bid. During the last go-round, Romney amassed $2.7 million from Utah in the initial three months, an unprecedented amount from a state not known for donating to national campaigns. What fueled the drop-off from 2007 remains uncertain, largely because former Utah Gov. Jon Huntsman was not required to file a campaign finance report Friday, like most of the GOP hopefuls. Huntsman entered the race June 21, which means his first report isn't due until October. Still, his campaign announced that it raised$2 million nationwide from donors. That means Huntsman could have siphoned off some Utah support from Romney, a fellow Mormon who led the Salt Lake Organizing Committee for the 2002 Winter Olympics. Other potential factors include a down economy and weak fundraising for Republican presidential candidates overall. "It is a challenging environment for candidates generally," said David Magleby, a political scientist from Brigham Young University who tracks campaign money. Magleby noted the 2008 campaign did not involve an incumbent president, creating great interest in both parties, while some donors are now probably skeptical about the chance to unseat President Barack Obama. As a fresh face to presidential politics, Romney raised $21 million nationally in the first quarter of his previous run. But now, as the GOP front-runner, he has brought in $18.3 million, an amount that still surpasses the rest of the Republican field combined. His numbers in Utah remain dominant. The other GOP candidates, minus Huntsman, snagged just $35,000 compared with his $1.3 million. Romney, former governor of Massachusetts, tallied more than $66,000 from executives of Vivint, a company previously named APX Alarm. He took in $39,000 from those associated with the businesses of Larry H. Miller and his family, including Utah Jazz CEO Greg Miller, who previously supported Horizon PAC, a group of Huntsman backers created to support a possible run for president while he was still in Beijing serving as Obama's ambassador to China. Other prominent Romney donors include former Olympians Rulon Gardner and Derek Parra, Hinckley Institute of Politics Director Kirk Jowers and former Utah Gov. Mike Leavitt. Romney captured nearly $1 million of his $1.3 million Utah haul from donors who gave the maximum individual amount of $2,500 for a primary election. Magleby said some potential donors may be sitting on their money, waiting to see how viable Huntsman's campaign becomes. "For most Utah donors," he said, "maxing out to both of them would be a little much." Obama, who collected $2.1 million from Utah in his previous campaign, has snared $57,000 from the state so far. He also raised an additional $10,700 for a separate Democratic fund that will support his 2012 campaign. To put the numbers in perspective, contributions from Utah equal about 7 percent of Romney's total of $18.3 million compared with about 0.07 percent of Obama's total of $86 million for his two accounts. But the Democratic president's fundraising totals in the state should shoot up soon. First lady Michelle Obama is expected to headline a fundraiser in Park City next week. Overall, Utah ranks 11th in contributions by state for presidential candidates and second in the West behind California. The state ranks sixth among Romney's biggest backers.